This West Loop office building was recently renovated by a new owner. 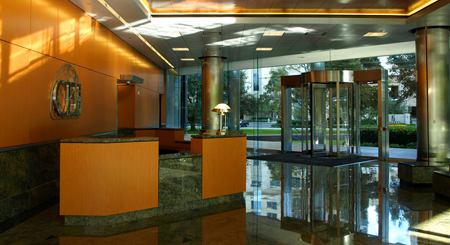 Chelsea provided architectural and engineering services for the project, including the redesign of the first floor lobby, pictured here. New finishes, including a suspended metal and wood paneled ceiling, and a new information desk, along with improved lighting created a stunning entrance for this Riverway landmark, the former IBM Building. A mid-century Houston residential landmark on Montrose Blvd., the Parc Condominiums have recently undergone a complete exterior facelift, with Chelsea providing the architectural and engineering services. The exterior concrete frame was cleaned, patched, and repaired, and then the white finish was renewed, along with treating the brick with a water –repellant coating for longer life. 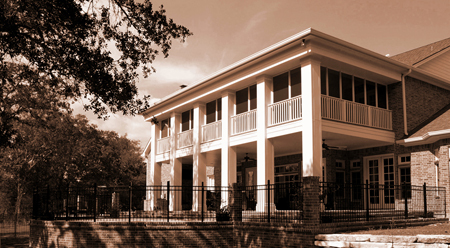 Then, the exterior fenestration, sliding doors and windows were replaced with new, insulated aluminum and glass units. The project also included a complete, top to bottom, restoration of the concrete parking garage, including new lighting and security systems. Chelsea designed this new residence in Fort Bend County for a retired couple. The home is designed for comfortable, everyday living for two, but with plenty of room for visits by their extended family and friends. Of course, no home is complete without a kitchen and this residence is no exception. This country kitchen is warm, inviting, and efficient; with a central island and dining bar for helpers and those whose only interest is, shall we say, the end results? This new Aggieland residence, northwest of Bryan, Texas for a retired couple from the Houston area was designed by Chelsea with the landscape in mind. The traditional 2-story home fits perfectly on the edge of a creek bed over-looking the surrounding woods. A 2 level porch on the creek side opens onto a patio for outdoor entertaining or just lounging with a cool drink.